Beachfront remodeled, walk in shower! Same day booking available! Our second floor unit eliminates the hassle and the need to use an elevator to access the condo. No need to use the elevator just hop right across the boardwalk and you are on the beach. 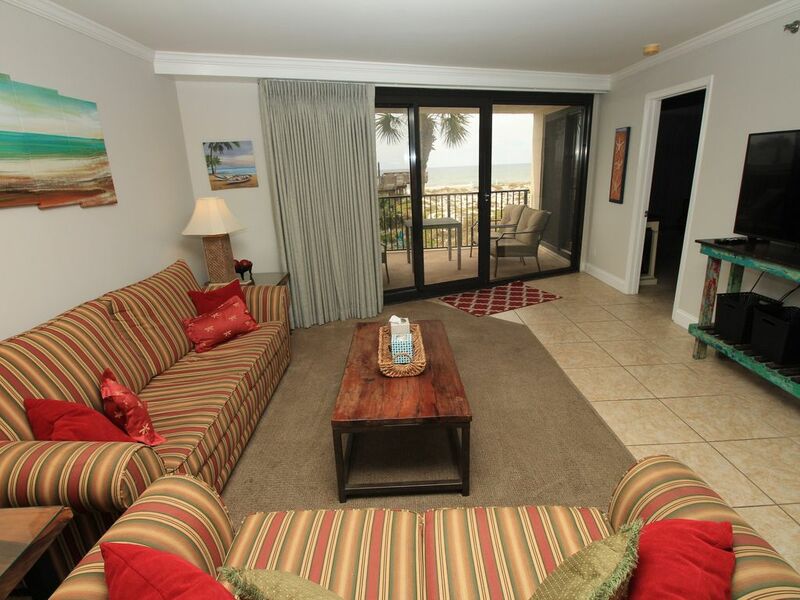 Unlike many of the second floor units, we have a view of what you came down to see…the beach and Gulf of Mexico! During Spring Break and Summer, we only rent Saturday to Saturday. Email to ask for exception. This Beachside One condo is a perfect beach retreat for your family. We are within walking distance to Finz and the Hilton Sandestin Beach Resort and their Spa, Serenity by the Sea as well as their many restaurants and conference center, but we are far enough away that we have a little peace and space from the crowded beaches through our own private, gated beach access. Our beautifully updated condo is spacious and has everything you and your family will need for a great beach vacation. The updated kitchen is fully stocked with all the basic necessities for a quick meal. The solid surface countertops, new cabinets and new appliances will make cooking a breeze. The master bedroom is spacious with a king sized bed and a wall of windows overlooking the beautiful Gulf of Mexico. Attached to the master bedroom is a full bathroom with double vanities and a walk in shower. The second bedroom has twin beds, perfect for any guests or little ones and has a bathroom right outside in the hallway with a tub that is perfect for soaking. There is also a sleeper sofa located in the living room that is handy for additional guests. * Baytowne Wharf - 42 unique bayfront retail merchants and restaurants. * Golf - 73 holes of golf on four championship courses. * Market Shops - specialty shops and amphitheatre. * Baytowne Marina - Ships' Store - 98 slip marina. * Topsail state park and nature preserve. * Grand Blvd. - upscale restaurants & shops. * Silver Sands Factory Stores - just one mile west of Sandestin. Pool is seasonally heated based on the discretion by HOA. We are the owners of this condo! We also have our own vacation rental company: Skis and Seas Vacation Rentals The Unique Benefits at this Condo: Our Beachside One unit is the condo for you if you are looking for a high quality well appointed and clean condo. This condominium is as close to parking, pool, boardwalk, and beach as you can get. New appliances, and carpet. Includes the Tram!! Our Beachside One unit is the condo for you if you are looking for a high quality well appointed and clean condo. This condominium is as close to parking, pool, boardwalk, and beach as you can get. New appliences, and carpet. Includes the Tram!! Pool heated at HOA descretion. We had a wonderful stay in Beachside I unit 4025 for NYE. The condo was perfectly located right next to the beach access and pool area. The beach was just a short walk across the dune walkover. The pool and hot tub we nice and not crowded, although I could imagine they might get busy in the summer. We were able to look at the fireworks from the raised viewing area at the end of the boardwalk, very nice. The condo was clean and comforable, and seems bigger than it is. The windows let in a lot of light and we had a nice view of the water from our room. We didn't use the kitchen much but it had everything to meet our basic needs. Communication and check in were very easy and Marcella was patient, nice and helpful. We would absolutely return to this condo and also recommend others to visit also. Very conveniently located beside the elevator and the boardwalk to the beach. The SanDestin resort was very impressive; the town of Miramar Beach was not. Decent restaurants were few and far between. The white sand beaches and warm crystal clear waters were amazing. Punching in a code at every gate etc became a large hassle. The management company was very friendly and helpful. The WiFi was very spotty with a poor signal when it was working apparently their using one router for per floor or building. Nice location and view. Sandestin is a cool resort. The amenities are fine. The location of the condo is ideal for quick access to the beach, pool and grill. The heated pool was nice to have as we didn't have the best weather. The whole Sandestin complex is very nice with easy access to restaurants and golf courses. The owner/agent communicated well and made our stay enjoyable. This condo was the perfect fit for our relaxing beach vacation with our kids. The location could not have been better—easy access to beach, pool and elevators. We enjoyed The Wharf in the evenings and lounging in the sun all day. I highly recommend staying here and we will definitely book again! We are super glad you had a nice time. Please keep us in mind for your next trip. Great condo, clean and easy access to beach. Check in begins at 4pm. Check out is at 10 am. Summer and Spring break is Saturday to Saturday only. email for Exceptions Rates are subject to change.